My first foray into the beauty of Banff was more than a decade ago in the height of summer. I took the train from Vancouver through the Canadian Rockies, then ended my tour with a few days in the bustling ski town. A year ago, I returned in winter: this time with my mom, my best friend and her mom in tow. It was one of the best trips to date—and far less crowded than in summer months, I might add—but I missed out on one of the area’s greatest draws: skiing in Banff. So when Travel Mindset invited me back for a weekend of skiing “the Big 3”—that’s Banff Sunshine, Lake Louise and Mt. Norquay—I rearranged my schedule, dusted off my ski gear, grabbed my favorite travel buddy and flew to Calgary. As far as ski destinations go, Banff is one of the easier ones to access. You fly into Calgary, an extremely manageable airport, pick up your car—the rental services of which are on-site (again, convenient! )—then head due west to the town of Banff. It took us exactly an hour and 25 minutes from the time we left the airport, and we had zero traffic coming or going. For my American friends, note that you do need a passport to enter Canada. We rented a larger SUV with snow tires from Enterprise’s airport location for $378 for the five days, though we didn’t wind up experiencing any precarious driving conditions whatsoever. All the roads, both the highways and the smaller ones that went up the mountains, were completely plowed and ice-free, and the driving could not have been easier. Not to mention, the views weren’t shabby at all. We opted to fly through Minneapolis instead of Toronto. I’d recommend this route (or another U.S. hub like Seattle) if you want to avoid guaranteed delays, as Toronto is one of the more confusing airports I’ve ever flown through when transiting back to America. From Nashville, it was about 90 minutes to Minneapolis, an hour layover, then just under two hours to Calgary. The flying-and-driving part of the trip could not have been easier. I’ve taken similar ski vacations to Colorado, and while I love the resorts there, the traffic getting to them is a turn-off. During all three of my trips to Banff, I’ve never run into any traffic on Canada’s Highway 1 (also known as the Trans-Canada Highway). First things first: You need to book your hotel. This was my third overnight trip to Banff, but my first staying in the iconic Fairmont Banff Springs. I’d been to this castle in the Rockies a few times before for meals, but as a bona-fide Fairmont Hotels fan, it had always been my dream to spend a night there. But there are a couple things you should know about this palatial property. 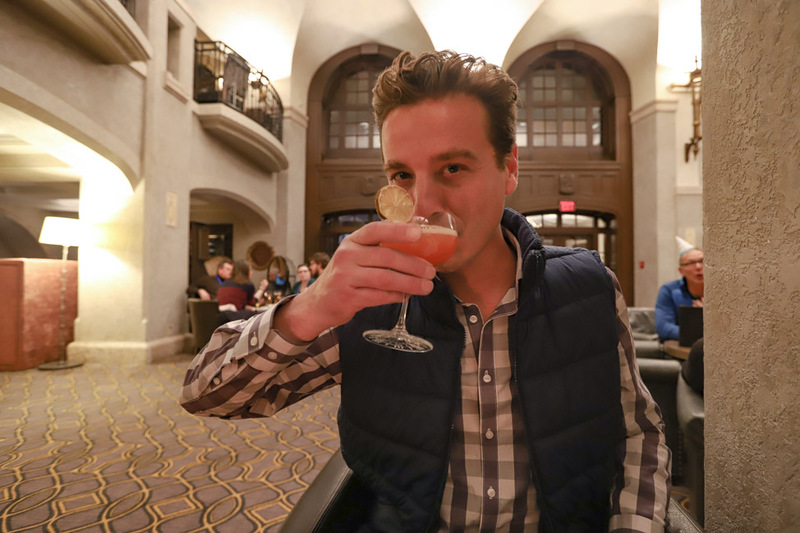 For one thing, the hotel first opened in 1888—the original structure burned down nearly 40 years later, and it was rebuilt and reopened in 1928—as the vision of railroad tycoon William Cornelius Van Horne. It sits smack within Canada’s first national park, established in 1885. Which brings me to this: You cannot enter Banff National Park without a pass, which costs around $30 for family access (or per car). You can either purchase one online or stop at the gate on Highway 1 when you enter the city. We stupidly didn’t realize you needed one just to get into the town and had planned to pick one up before we ventured into the mountains—then got a ticket on our car. But in true polite Canadian fashion, it was simply a warning and we were able to pick up our pass on the way into Lake Louise and make good on our rookie mistake. 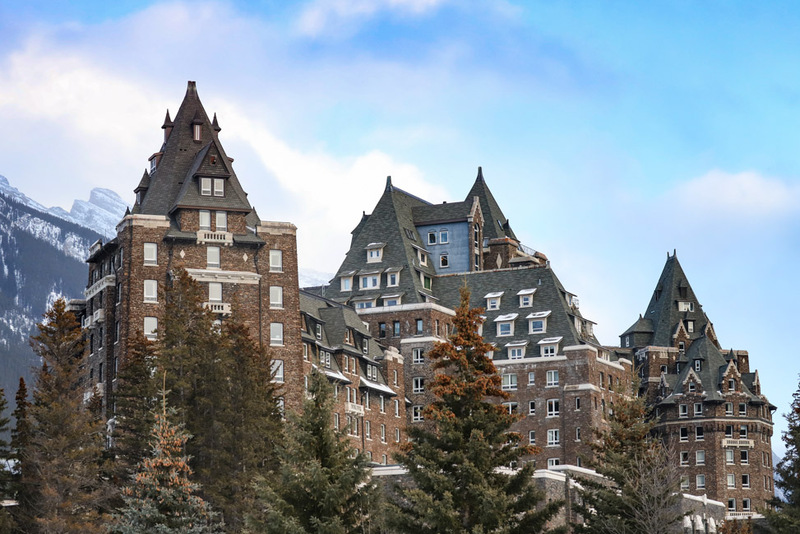 One-hundred-and-thirty years after its initial debut, Fairmont Banff Springs now bears the designation of being both a National Historic Site of Canada and a UNESCO World Heritage Site. There are 764 rooms, so it’s very easy to get lost in the labyrinth comprising this hotel (and we did, I’ll admit, a time or two). Since this is one of the brands oldest properties, it definitely has a more old-fashioned feel than some of the newer Fairmonts we have stayed in, and rooms are on the smaller size. I love that despite its opulence, pets are welcome, and we saw several dogs roaming the hotel with their owners. Ella would be so jealous! While the Fairmont Banff Springs feels remote, tucked up against the mountains in a very regal fashion, it’s actually less than a mile from Banff Avenue, the main drag in town, and just 15 minutes by car from the nearest ski resort. We easily could have walked, but it was a wee bit chilly, so we took advantage of the hotel’s complimentary shuttle to get into town and the city’s free bus service to get back. Like every Fairmont I’ve ever visited, it has a gorgeous Willow Stream Spa with various plunge pools and a larger mineral pool perfect for soaking in after a long day on the slopes. In addition to the regular massage and facial treatments, there’s a host of other spa offerings like saunas, steam rooms and a salon. We ate the majority of our meals at the hotel, simply due to ease before leaving in the morning, as well as fatigue when we returned at night, not wanting to shower, get all dressed up and venture out again. And with 13 different restaurant/bar concepts, as well as in-room dining, we could have eaten every single meal at the Fairmont Banff Springs without repeating once. Most mornings, we grabbed food to eat on the go at STOCK, the cafe-style restaurant and bakery in the lobby of the hotel. I don’t like to fill up too much before hitting the slopes, so we usually had avocado toast or yogurt and granola before taking off for the day. On the lone morning we got a leisurely start, we took advantage of our added time in the hotel and dined at the Vermillion Room, which had a very Art Deco look to it and was quite different from the aesthetic throughout the hotel. One night, we did après at Grapes wine bar with a group of friends and gorged on wine and cheese, charcuterie plates and Old Fashioneds. Another evening, just SVV and I settled in for a bite and round of cocktails (OK, two) at Rundle Lounge, which despite its size still feels fairly intimate and had live music to boot. We did not, however, get to partake in Fairmont’s famed afternoon tea, so this will be the first thing I do when next we return. There’s also a golf course for those traveling during warmer months. A big perk of skiing in Banff is the fact that you can buy the SkiBig3 pass and get access to all three resorts, which lay claim to nearly 8,000 acres of skiing, two gondolas and 26 chairlifts. Definitely buy the pass online before you leave on your ski trip, as there are often substantial savings on the pass, as well as offers for ski-and-stay packages. You can bring your own gear or rent it from SkiBig3’s Adventure Center in downtown Banff. A three-day ski pass for this month, which is good for three days on any of the mountains over a five-day stretch of time, runs just $250 (or about $83 a day, which is less than half of what I paid for a single day on the slopes on my last trip to Colorado). That also includes complimentary shuttle service to/from all of the resorts. I honestly couldn’t believe how much more affordable it was to go skiing in Banff than resorts of comparable size in the United States; of course, it also helps that the U.S. dollar is strong in Canada right now. Like all ski resorts, there are seasoned pros available for lessons for adults and kids, as well as a ski school that I’d advise any family with little ones to take advantage of. New to SkiBig3’s offerings is the Guided Adventures, which we made use of when a ski instructor toured us through the three resorts in back-to-back-to-back ski days. While I was living in California and had my Tahoe annual ski pass, I often employed an instructor to go with me simply to cover more terrain in a day, and this option at SkiBig3 is a game-changer, particularly for those who are new to skiing in Banff and Lake Louise and/or have a limited amount of time; you see a lot more of the resorts than you would if figuring out the ropes on your own. I love that we didn’t waste any time trying to navigate the mountain on our own, as we had one of the ski instructors, Jamie or Carlo, guiding us almost the entire time. Once you’ve tackled all three resorts during your time in Banff, be sure and redeem your ski pass at SkiBig3’s Adventure Center for a complimentary pint of beer at the Elk & Oarsman, as well as a trail sign souvenir. What it’s all about: Mt. Norquay is a great place to get your ski legs and warm up before tackling a more serious mountain like Lake Louise. Dubbed “the locals’ mountain” by ski bums and featuring eight lanes of a tubing park with a magic carpet towing system in addition to four lifts, this resort is on the smaller side, while still sporting fairly challenging blues and blacks, particularly on an icier day. It also has a readily accessible and wide-open trail on the four-chair Cascade that is perfect for beginners and younger children just starting out, plus is home to one of the largest ski and snowboard schools in Canada, with training levels at all stages of skill and age. Mt. Norquay has daycare, a terrain park, downhill race course and night skiing until 9pm—it’s the only resort that offers this—in addition to on-site rentals. The food experience: At Norquay’s Cascade Lodge, you have the option of more grab-and-go pub food downstairs or gourmet fare in the Lone Pine Pub on the second level. If you have the time, I recommend the latter, as the menu is very elevated for a ski lodge with seasonally diverse bites from Executive Chef Morne Burger like bao buns, arancini and salads. At the very top of the mountain is Cliffhouse Bistro, where we ended our final afternoon of skiing with craft beer and s’mores over the fire. Not only does Cliffhouse have some of the best views in the area, but we got to ride a two-person chairlift up (and down!) without skis that reminded me a whole lot of being in the Alps. 10 out of 10 recommend doing this, whether you’re a skier or a lodge bunny. The benefits of Mt. Norquay ski resort: You can land in Calgary in the early morning and be on the slopes in the afternoon to get a practice run or two in before going hard in the coming days. It’s one of the smaller mountains, but it’s also the closest to town, so very easy to access if you only want to squeeze in a couple hours on the slopes on any day during your trip. Family excursions will particularly benefit from a visit for the convenience alone. What it’s all about: Lake Louise Ski Resort used to be the biggest in all of Canada, and it’s definitely my favorite place to have skied ever. It’s about five miles from the lake itself with the most picturesque views and variable trails in this section of the Canadian Rockies. Massive terrain parks for skiers and snowboarders coupled with front and backside lifts on 4,200 acres of alpine forest make the crowds, particularly during a weekday, seem insignificant. Keep an eye out for lynx and their children on the deserted gondola runs, particularly Juniper where a mama and her two cubs were spotted the day we arrived. The food experience: Being one of the biggest (and best), Lake Louise has a dozen dining options, spread throughout the sprawling resort. We had fully planned to have ramen at Kuma Yama at the resort’s Lodge of Ten Peaks, but instead found ourselves mid-mountain at Sawyer’s Nook around lunchtime, not wanting to waste any time trying to ski back down to base camp. This wound up being a very happy mistake, as Sawyer’s was one of the best meals we had all trip, with a decadent burger served on a pretzel-style roll with a pepper aioli and a bit of a kick. I’m still dreaming about that burger. Once you’re done skiing, I highly recommend hitting up the Fairmont Chateau Lake Louise before heading back to Banff for a bite at Alpine Social, a drink in the ice bar and a mosey onto the frozen lake. It’s one of the most iconic spots on Earth. The benefits of Lake Louise ski resort: There’s a lot of intermediate terrain that crisscrosses both the front and backside of the mountain. Even if you’re a beginner to intermediate, there are plenty of green and blue runs that leave from the very top and there’s always an easy way down. On the flip side, it’s got some of the best terrain for experts, as well. The Back Bowl is essentially filled with mini-helicopter drop-in spots that have rocky chutes and steep slopes surrounded by the beginner trails. Everything is clearly marked and is absolutely epic for an adrenaline junkie (or the spouse of one who wants to make sure his/her other half makes it to the bottom). What it’s all about: Banff Sunshine comprises three craggy mountain ranges and feels like a surrealist painting of another world. The views are spectacular, distracting and will have you yanking off a glove for a selfie or landscape picture for at least the first half day on the slopes. With 3,300 acres of accessible snow terrain, eight high speed quads, a gondola and a literal anomaly in the chilly world of snow-filled adventures, a BUBBLE-ENCLOSED HEATED lift, you’ll be blown away at the elevated nature of this Canadian wonderland. We actually started our ski week at Sunshine Village, but if I were to do it again, I’d do Mt. Norquay first to get my ski legs back, Lake Louise on the second day as it’s undoubtedly the toughest terrain, and Sunshine on the final afternoon as there are plenty of wide-open groomers, perfect for lazy cruising or a muscle-burning, 15-minute speed run. Note: You have to take the gondola up to the chairlifts, which was about a 20-minute trip. If you leave a half-hour before dark by skis or snowboard, you can cruise all the way to the bottom from the village, and it was one mighty fun and scenic ride down. We took a black diamond for part of it, but if you’re more comfortable sticking to green, there’s one that goes all the way down to the base. The food experience: We had lunch at the hotel’s Eagle’s Nest Bistro, which was mainly salads, sandwiches and the like, then snacks and après drinks at Mad Trappers following our afternoon skiing. 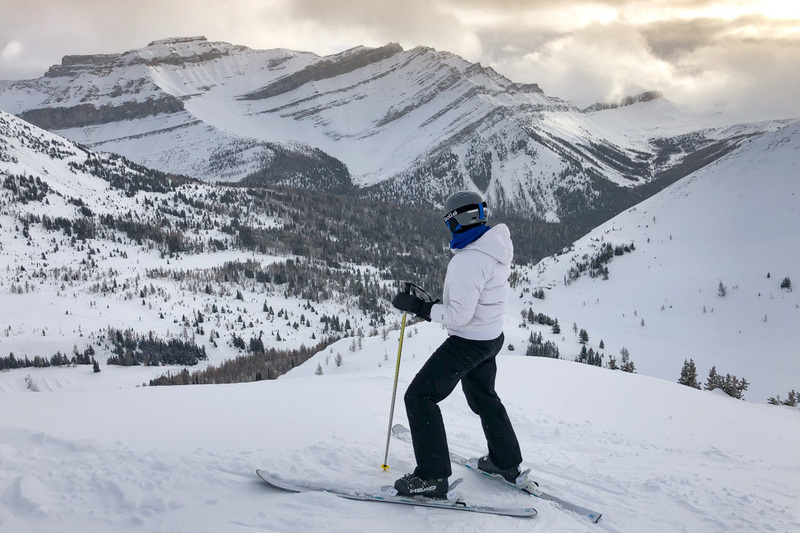 The benefits of Banff Sunshine ski resort: We’ve played on mountain slopes across the northern hemisphere, from California to the Alps in Switzerland, and both of us agree that this is top of the list for amenities, views, crowd size and diversity of runs. Most of our trips down the mountain (albeit mid-week) were completely devoid of other human beings. One of the guides gave us a neat trick, too: shift around from the top of the mountain to middle mountain at mid-day so you beat the half day crowd. It totally worked. Genius! There’s no shortage of delicious places to eat in the town of Banff, but one mistake we made last year was not making reservations, particularly on the weekends. So be sure and call to reserve your dinner table at least a few days in advance. For breakfast, I’m a fan of Wild Flour Bakery, while our ski instructor friends tell us Juniper Hotel Bistro boasts one of the best brunches in town. Park Distillery has a great weekend brunch, though it doesn’t open until 11am. Chuck’s Steakhouse is your place for all things meat—don’t pass up on the corn bread pudding or cheesy garlic bread either—while Banff Ave. Brewing Co. is a prime spot for a quick bite and a few pints. Craving pizza? Bear Street Tavern has some of the best pies I’ve sampled in ages, while High Rollers bowling alley is also ace at both pizza and craft brews (be sure and book your lane weeks in advance; this place is always packed). On site at the Fairmont, we had our best meal in all of Canada: a Bavarian feast at Waldhaus. Even if you don’t stay at the hotel, I’d recommend you plan a dinner at this German-style restaurant; it’s divine, and you can’t leave without the chocolate fondue for dessert. If you’re a Fairmont guest and dining here during winter months, opt for the free shuttle, as it’s a bit of an icy walk down to the restaurant. Overall, our trip to Banff lasted four full days, which was sufficient enough for a sampler of the area, but I’m convinced I could have spent a full week skiing the Canadian Rockies and not grown bored with the varied terrain (plus, all those restaurants and bars to try!). Note to self: Next time, stay longer! This project was in partnership with Travel Mindset, SkiBig3 and Fairmont Hotels. All opinions and ski-related injuries are my own. My husband and his buddies did a backcountry backpacking trip in Banff for this bachelor party (which is so typical of him–no strip clubs in Vegas for my mountain man husband) and he’s been talking about the two of us taking a trip back there ever since. This post might just be enough to make me pull the trigger! Great blog, Kristin & gorgeous pictures! Steve and I will be escorting an incentive group to Banff and staying in the Fairmont Banff Springs for the 2nd time in a couple of weeks and we can’t wait to get back there. One of our favorite places in the world! I hope y’all had a great trip and some epic snowfall! Giiirl that Waldhaus shot of the interior is SO good!! Best meal of the trip, hands down! Make sure you stay warm out there on the slopes!